Lazare Picault Hotel has its own in-house Bar and Restaurant. The restaurant is built facing the Indian Ocean where guest can enjoy a romantic and breathtaking panoramic view. Our heartwarming breakfast is served here every morning with a variety of local seasonal fruits to start the day. Guest can taste our traditional Creole cuisine. 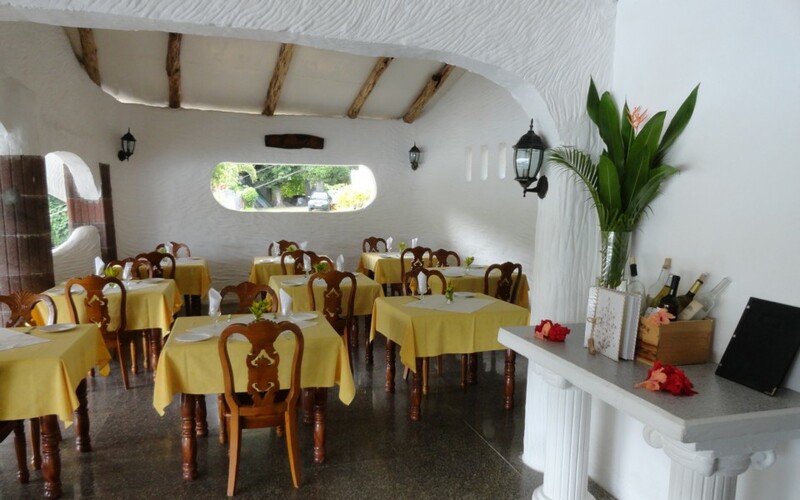 Our specialty is mainly seafood where exotic species have been use to savor the dish for a mouth watering experience. Our seafood specialities are mostly, octopus, prawns, local fish and/or lobster. We also have meat like chicken, pork and/or lamb. All our dishes are served with lentils, chutney or salads. At the Bar there is a variety of alcholic and non alcholic beverages available. Guest can try our local fresh local juice, soda drink, Seybrew beer, imported wine and other imported drinks. We do reccommend to dine with us as to taste the beauty of Seychelles through our creole delicacies.